"I was raised on Lefse as a special treat for the holidays. We still make it every holiday season, and this is the best recipe ever. We eat ours with butter and sugar. Note: you will need a potato ricer to prepare this recipe." Cover potatoes with water and cook until tender. Run hot potatoes through a potato ricer. Place into a large bowl. Beat butter, cream, salt, and sugar into the hot riced potatoes. Let cool to room temperature. Stir flour into the potato mixture. Pull off pieces of the dough and form into walnut size balls. Lightly flour a pastry cloth and roll out lefse balls to 1/8 inch thickness. Cook on a hot (400 degree F/200 C) griddle until bubbles form and each side has browned. Place on a damp towel to cool slightly and then cover with damp towel until ready to serve. Um, you need at least 2 more cups of flour for this recipe. My dough turned out wetter than cookies dough. Stuck to my fingers like mad. Tasted good...once I added 2 more cups of flour. Perfect lefse! 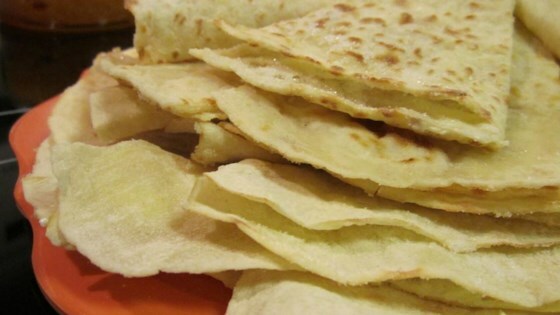 I've been looking for a good lefse recipe for a long time, and this one has the most traditional taste and texture. Wonderful!